In 1920, the United States enforced the 18th Amendment to the U.S. Constitution which banned liquor production, public consumption and the selling of anything alcoholic. This catapulted the criminal world and helped the gangsters monopolize and grow their illegal business of alcohol. It made some of the most vicious gangsters gain fortune and fame. Illegal bars known as speakeasies opened by the tens of thousands all over the country and served bootleg liquor to the thirsty public. When something is illegal it creates an underworld that will stop at nothing. 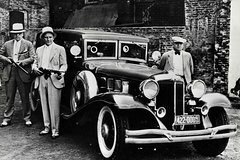 On this tour you will walk in the footsteps of the gangsters and visit some of the watering holes that served illegal liquor during Prohibition. While sipping on your now "legal" alcoholic beverage you will hear stories of the Mafia and how it infiltrated into society. At the end of the tour you will be a "wiseguy" about prohibition and the mob. Start time is 2 PM on Tuesdays, Thursdays and Sundays. We will visit three or four pubs in three hours time. Meeting location is in Petrosino Square. The tour will be in the NoLIta and Little Italy neighborhoods. We will walk approximately 1.1 miles on the tour between the pubs. The tour will include one complimentary beverage not to exceed $10. Tour goers will be responsible in paying for subsequent drinks. Between the pubs, you will see the sights and you will learn some of the history related to those sights. Tour content will include some true crime history on the streets including Mafia history and the history of Prohibition. Included in this narration will be the rules and regulations of Prohibition. What was legal and what was illegal. The changes the liquor industry underwent during Prohibition. We'll examine a few of the gangsters who had ties to the neighborhood. We'll learn their biographies and how they may have met their demise. We will spend approximately 35 to 40 minutes inside each pub. You will have the opportunity to drink cocktails from another era and learn about mixology. Further, most pubs we visit will have food menus as well including the original location. Tour will run rain or shine. The pub crawl will end at the corner of Grand Street and Centre Market Place. Both locations are very close to more restaurants and public transportation. The pubs we visit on this tour were actual speakeasies during Prohibition. One place takes cash only so please have some cash on hand. The other places will take all major credit cards.